Senator Joseph Lieberman continues to be America’s strongest advocate of widening US wars in the Middle East to include a pre-emptive American attack on Iran. Many experts including Zbigniew Brzezinski have argued against Lieberman’s approach to Iran stating that such an attack would lead to a violent reaction that would force the US out of the region and lead to the collapse of the state of Israel in 5-10 years time. The world faces a stark choice between imposing tough sanctions on Iran to stop its nuclear program, or attacking it, United States Senator Joe Lieberman said Saturday. Lieberman is the influential chairman of the Senate committee on homeland security. He was speaking a day after Iranian Foreign Minister Manouchehr Mottaki said that his country was ready to accept an international swap of uranium, but only under certain conditions. “We have a choice here: to go to tough economic sanctions to make diplomacy work or we will face the prospect of military action against Iran,” Lieberman told the annual Munich Security Conference. Top U.S. commanders are already working out how such a strike should be conducted, and although “no-one wants this to happen … unless we together act strongly and do more than talk that is exactly what will happen,” Lieberman said. A nuclear-armed Iran would provoke chaos in the Middle East, send world oil prices soaring and end any hope of a peaceful solution to the Israeli-Palestinian conflict, Lieberman said. 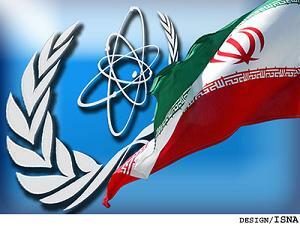 Earlier Saturday, the head of the United Nations’ nuclear watchdog said, after talks with Iran’s foreign minister on a nuclear fuel swap plan, that he sought an accelerated dialogue with Tehran. International Atomic Energy Agency Director-General Yukiya Amano told reporters after his talks in Munich with Mottaki that dialogue on Iran’s nuclear program is continuing. Meanwhile, Mottaki described his meeting with the IAEA chief as “very good,” but repeated Iran’s insistence on determining the amount of fuel to be exchanged and said it might be less than the 1,200 kg of low-enriched uranium (LEU) which world powers have asked it to part with in one go. In exchange, Iran would receive uranium of a higher grade which it could use to fuel a Tehran research reactor producing medical isotopes. “It is very common that in business, the buyer talks and offers about the quantity, and the seller only offers the price,” Mottaki told reporters at the Munich Security Conference. From the point of view of the United States and others, the proposed swap would reduce the risk of Iran enriching its low-grade uranium to the degree required for potential use in a nuclear weapon – an intention Tehran denies. “We discussed and exchanged views on a wide range of issues – views about the proposal that is on the table,” Mottaki said. “I tried to explain the views of the Islamic Republic of Iran for the Director-General,” Mottaki said. He was elaborating on comments he made on Friday, suggesting an agreement was close. The United States and Germany on Saturday voiced skepticism about Iran’s intentions and said those remarks had not gone far enough. Mottaki rejected a questioner’s suggestion that Iran’s leadership was divided over the proposed uranium deal. “In Iran there is only one voice about the issue. And that is, the exchange of fuel has been accepted and recognized. As I told you before, there have been certain doubts about it, and efforts were made to remove these doubts,” he said. Mottaki did not address the timing of a proposed swap, a problematic issue in negotiations. On Friday he spoke of a ‘simultaneous’ swap, whereas the six-power group wants Iran first to ship its LEU abroad and then receive it back when sufficiently enriched to use in Tehran reactor. The IAEA’s last report in November said Iran had registered a total of 1,763 kilograms of LEU, a quantity experts say would be more than enough for one nuclear bomb if it were enriched to the level of 90 percent.